This post and site have moved. Being my first time and all, I was expecting to learn some lessons. I imagined balancing the cones would be an issue, but in fact that wasn't a problem at all. I was also concerned with the wet batter breaking through the cone. That did happen a little, but not too much. What I should have been careful of, however, was overflow. So cute. I remember them from a friend's party in like 2nd grade! Golightly, I stood them on a cookie sheet and carefully lifted and placed the cookie sheet in the oven. That worked fine. They don't move or shift in the oven. As far as transport, they were in the little mini-cupcake plastic container and in a box. The sides of the container weren't high enough and the cupcake cones kept falling on one another. The buttercream frosting was fairly stiff, but did get a little smushed. I am thinking long cardboard strips between each row would work... There is definitely room for improvement as far as cupcake travel containers go. I am the "friend" she is talking about and the cupcakes tasted great and looked beautiful. God... If only you did mail order! When I was about 12, I brought a batch of these in to my classmates at my birthday. Obviously, they were a huge hit. You can't get a cuter cupcake. Ooh, these are the prettiest things! I've been wanting to try these out for the longest time. What's it like to eat? Does the cone get in the way? And yes, do you bake the cones in a muffin pan or do you stand them up on a baking sheet? 2. Prepare cake mix as directed on package--except fill each cup 2/3 full of batter (1 heaping tablespoon each). 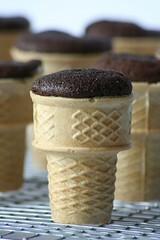 Place ice-cream cone upside down on batter in each cup. 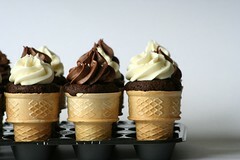 I searched the internet for an "ice cream cone cupcake recipe" and this was the best-looking one I found. I made them this morning for my daughter's last day of preschool >sniff<. My mom made these for me to take to school back in kindergarten or first grade, and I wanted to make them for my little girl. 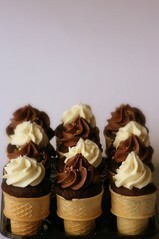 Anway, they are sooo yummy and the cones stayed pretty crisp.